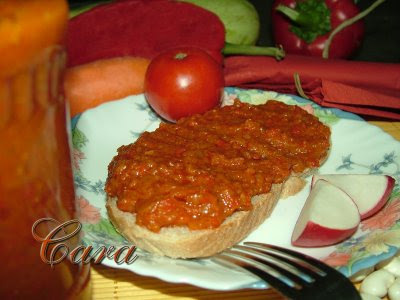 A traditional vegetable spread found in Romania (probably in other neighboring countries as well). It is delicious on crust bread or even as a topping on rice for a quickie vegetarian meal. It is also excellent as a sandwich spread. This recipe is for a large batch intended for canning. You can cut it back if you want a smaller batch for immediate consumption. Over an open flame (gas stove or grill) completely blacken the skins of the eggplants and peppers. Peel skins off immediately. Easiest way to get the last bits off is to do it under a slow running faucet. Puree each of the three vegetables separately in a food processor. And place each in a separate bowl when you are finished. Place oil and onion in a large pot. Saute onions for about 4 minutes over medium-low heat. Add eggplant, onion, salt and pepper. Cook until a thin layer of oil remains on top and when a spoonful of zacusca is removed, only the oil should run off the spoon, not the zacusca. Taste and adjust salt and pepper to meet your tastes. Spoon mixture into sterilized jars of your choosing. It is easiest if they are all the same size. Wipe rims clean and place clean lids and rings on jars. Place into a single layer in large pot (water bath canner if you have one). Fill pot with water up to the necks of the jars. Bring to a boil and boil for 20 minutes. Remove from heat and allow to cool in water bath. When cool remove from water and you are ready to go. If oil separates just mix it back in when ready to serve. NOTE: My original Romanian recipe calls for a full Liter of oil but results in a much heavier and oilier zacusca. I cut mine back substantially from the original.